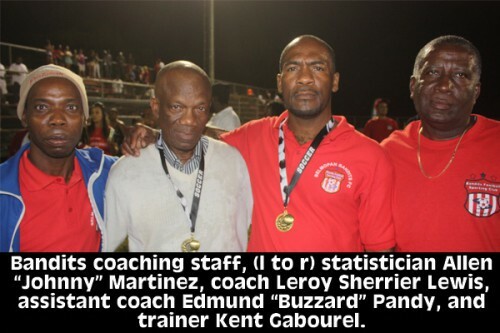 Reliable reports reaching our sports desk tonight say that former national team coach Leroy Sherrier Lewis responded to a text question while on the Sports Zone show on Plus TV tonight. Asked if he would consider coaching the Belize National Team again, Sherrier Lewis reportedly said that he harbors no hard feelings toward anyone, and as long as the people in charge have the same passion and love for the game as Saldivar does (Min. John Saldivar is owner of recently crowned national champions, Belmopan Bandits. Saldivar brought in Sherrier Lewis in mid-season to take over the coaching of the Bandits. ), then he would be open to coaching the national side again. Of course, Saldivar is not likely to release Sherrier Lewis until after the upcoming PLB Closing Season run-up to the CONCACAF Champions League; but it would be a smooth transition for Sherrier Lewis, as the Bandits presently include a number of former national team players.